January 2016 has been a MONTH. I don’t know how else to describe it. I rang in the New Year by going to work at 6am, and then spent up until the 22nd working in a frenzy to meet all of my coursework deadlines and prepare for an exam. 10,000 words of coursework in total almost caused me to lose the will to live. The last week has been extremely fun, but somehow has been SO BUSY despite being free from revision. I don’t know how I’ve been so busy, but it’s been great, and now I go to Budapest today! As I’m writing this (the night before) I’m having a major freakout over fitting everything into my hand luggage as RyanAir give you about 3cm to work with and my camera takes up almost 1/4 of my case. ANYWAY. 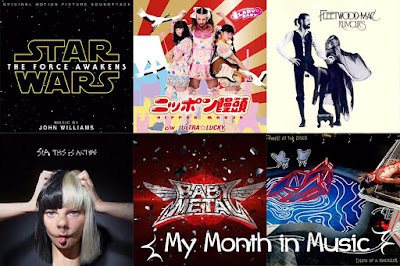 Here’s the music I’ve been listening to this month. I only began to listen to Fleetwood Mac last month, I know, I’m 40 years late to this party, but what a great party it is! Everywhere is my go to song, but I do love Dreams too. How did I go over 20 years without listening to them?! I love movie soundtracks, especially anything John Williams! I loved The Force Awakens more than I could have imagined, so this soundtrack has been playing a lot this month. Especially because I can easily work with soundtracks playing in the background since I don’t get distracted by lyrics since there are none! Rey’s Theme is easily my favourite piece on the soundtrack, I listen to it on repeat to chill out, which has helped considering I’ve spent the last few weeks mostly stressed out! So Kawaii Metal is a whole genre I didn’t know existed. Essentially, it’s a mix of JPOP’s cutesy sound, with metal. It’s so absolutely ridiculous and I love it. It somehow works, and I can’t stop listening to it. Prepare for your life to be changed. Sia’s new album came out yesterday, I’m a big fan of her work and love it already. Cheap Thrills and Alive are my favourite so far, as I haven’t really listened to everything else as much as I would like just yet! For some reason it won’t embed the actual video, which is annoying because the video is SO GREAT. I want to try filming something with snappy motions like it. Before this song, I hadn’t listen to Panic! since probably 2009/10. From year 7 (2006) to year 9 (2010) I LOVED their music, but then suddenly fell out of listening to it! Now it’s time to make up for lost time! Their new album, Death of a Bachelor, is incredible, but this song is one I specifically cannot stop listening to. So that’s my month in music! Thank you for reading, and I’ll be back in a few days with a post on my trip to Budapest!! I’m so excited, but right now I’m mainly stressed over packing. Good times.